I was fortunate enough to attend this year’s Annual Ticketing Innovation Summit in Lisbon, held in the luxurious surroundings of the Pestana Palace hotel. It was a hugely interesting and informative couple of days for me, focused on the transportation sector. There was access to top-flight thought leadership and some of Europe’s largest transportation operators and suppliers such as Belgian Mobility Card, Czech Railways, Telesoftas and Calypso card networks. Not to mention a slightly crazy amphibious sight-seeing trip which was both entertaining and gave our company insurance policy a healthy stress test. I was delighted to be invited to 10 Downing Street today, as part of a group of small businesses led by Enterprise Nation. UrbanThings empowers intelligent mobility and we do this by working with public datasets of transportation data. However, there exists no mandate for bus and rail operators to release such valuable information as Open Data. Given that such operators are subsidised by the public purse, and the obvious value of this data, we think that such a mandate is necessary and should form a key part of the actual franchise agreement to which operators subscribe. A great place to make a start at enforcing this would be the forthcoming Buses Bill. Anecdotally, we have heard that some operators are opposed to these measures not because of any fundamental opposition to the concept of data sharing, but because of a fear that greater scrutiny of their data might result in levies or fines, for example, from the Transport Commissioner. We would urge the government to offer the necessary reassurance to operators that opening up their data for the wider good would not lead to such punitive measures. We would draw attention to Transport for London’s Open Data policy, a perfect example of an unrestricted policy that has reaped rewards in the nation’s capital. TfL make all their operational data available for free, and this approach has fostered a rich marketplace of application development that, in turn, encourages increased footfall back to the operator, completing the perfect circle. London Tech Recruitment is Tough! Extended financial support for SMEs in their crucial early stages, for example an increase to the Employment Allowance or the ability to reclaim the first £20,000 of PAYE for companies with less than 5 employees operating in the technology sector. Address the issue of supply with an increased focus on technology and programming in UK curriculums from an early age. I was most grateful to Daniel for listening to our wider points, to Enterprise Nation for arranging the visit and I very much hope that our feedback will be taken on board. Sadly I also forgot to nick any Downing Street loo roll, so came away with only the memories. Saturday saw the UrbanThings team head west for Bristol API Hackathon 3. Hosted at Just Eat’s Bristol HQ, the Connecting Bristol event was a sell-out with dozens of eager developers arriving for a day of hacking. October’s challenge was how to ‘Travel Bristol (on a budget)’, and our eager coders spent the day combining both concepts while the Just Eat Tech team provided pizza after pizza – a solid must have for any developer… but thankfully the beer fridge wasn’t opened until the afternoon! At the end of the day, each team presented their solutions to a packed crowd, and the pitches were judged by representatives from UrbanThings and Connecting Bristol. We had some fantastic presentations, including a highly commended one from Team Street Art who developed a creative way to encourage walking round the city by planning journeys via street art. This was achieved by mashing up geotagged photos from the Flickr API with journey planning from Google and the Bristol API. Saturday’s winners were Peter Bridger, Andy MacLean, Luke Parry and Daniel Williams of This Is Zone with their innovative solution for analysing people’s commutes and suggesting ways to save money. The winning solution used data from the Bristol API, including our journey planning endpoints, and the team also presented a skillfully designed prototype app. As well as winning £100 on the day, This Is Zone are now in with a chance of winning a £1000 digital workshop with leading creative agency Big Mallet. Thank you to Just Eat Tech for hosting and feeding us all, and keep watching this space for details of the next hackathon. When creating assets for mobile apps, it can be a pain – and a time drain – to manually resize multiple images to their relevant screen density. For example: 1x, 2x, 3x in iOS or MDPI, HDPI, XHDPI etc in Android. There are several great plugins for Photoshop that automate this process; but little in the way of Mac-specific workflows: it’s time for AppleScript and Automator to come to the rescue! With a little experimentation, I created an AppleScript that allows you to re-size and copy an image into various asset-specific subfolders. And with Automator magic, this can make your resizing process as simple as right-clicking on a file. Copy the contents of this AppleScript file to the Clipboard. Open the Automator app in Mac OS, then create a new workflow of type ‘Service’. Set the input to your Service with ‘files or folders’ and ‘Finder’ in the dropdowns. Drag the ‘Run Applescript’ action into your workflow and then paste the contents of the AppleScript file into it. Save the Service using a descriptive name such as ‘Create Mobile Assets in Folders’. Save your image file somewhere at x4 of full size, i.e. XXXHDPI. Right click on the image file in ‘Finder’ and choose the shiny new option that should now be in the drop-down menu. Subfolders will be created for each size ratio and the image will be copied into them. As mentioned above, the script assumes that your image is already x4 of display size, i.e. XXXHDPI in Android terminology. If you need to change this, or customise the sizes and ratios, just edit the first two lines of the script accordingly. I hope you find the workflow useful as it can save many hours of fiddling around! As UrbanThings expands, so does the number of great suggestions for our mobile apps. These come from end-users, beta testers and our own internal team – anything from great ideas for UI tweaks to full-scale feature additions. We love all this feedback and we don’t want to lose it. Integrating feature and enhancement requests into our workflow posed an interesting challenge. We use JIRA to track our software development; filing new suggestions directly into a platform team’s JIRA seemed a little intrusive, but documenting them entirely outside of JIRA seemed disconnected from the process. We knocked around some ideas to help generate a process that would track these valuable ideas and PAT came to our rescue. PAT is our newest JIRA Project, or to give him his fuller title, ‘Potential App Tasks’. Functionally, PAT exists as a ‘clearing house’ for ideas and suggestions that come from our end-users and development team. End-user support staff and developers generate enhancement and new feature tasks, and file these as issues within PAT. We use components to track the relevance of each issue to one or more platforms. We also integrate JIRA with ZenDesk to track any related end-user feature requests. The Product Manager periodically prioritises and approves key tasks. Approved enhancements are then filed as new issues in one (or both) platform-specific JIRAs, and linked back to their PAT ‘parent’ for tracking purposes. Development teams then integrate the enhancements into their regular sprint planning. The enhancements are completed and the apps are updated. At this point, any linked end-user tickets in PAT can be actioned and the users informed that their super-amazing suggestion has gone live. And, of course, nothing says PAT quite like our choice of Project Avatar. Myself and the team were at Bristol’s Watershed today to help run the second of this year’s Bristol API Hackathons in partnership with Connecting Bristol. The challenge was ‘A Cleaner Leaner Bristol‘. How can we reduce the number of single occupancy vehicles on the roads that contribute to pollution? We were also spreading interest in the live Electric Vehicle Chargepoint data that the team have been integrating into The Bristol API, and helping participants to download and visualise this. • A ‘Plan around disruptions’ idea that involved smarter journey planning in the event of disruptions and some clever routing around incidents. • ‘Three Stop Hop’ application to make the most of First buses’ discount ticket that only covers travel between three bus stops. • A ‘Green Days Out’ tool that combined city pollution sensing data with POIs in The Bristol API to suggest and then plan journeys to greener places. In the end, the judges decided to award the prize to the ‘Three Stop Hop’ project. The judges felt that this was particularly innovative, had universal appeal (“everyone loves a bargain”), applications outside of Bristol (e.g. zonal travel) and also tied in with wider council initiatives to encourage healthier travel. Lizzie Darville, Russell Day and Tom Harts received the day’s prize of £100 cash from UrbanThings, plus a chance at the year’s ‘Grand Prize’ of a design workshop worth £2,500 from leading digital design agency Big Mallet. A fantastic day was had by all – there was intense coding, litres of coffee drunk, and multiple salty snacks and beers to round things off. Our thanks to all who came along and, as ever, the tireless work by Katherine, Matthew and the Connecting Bristol team to make it all happen. Photos courtesy of John Kinson, and click here to read Lizzie’s blog about her day. 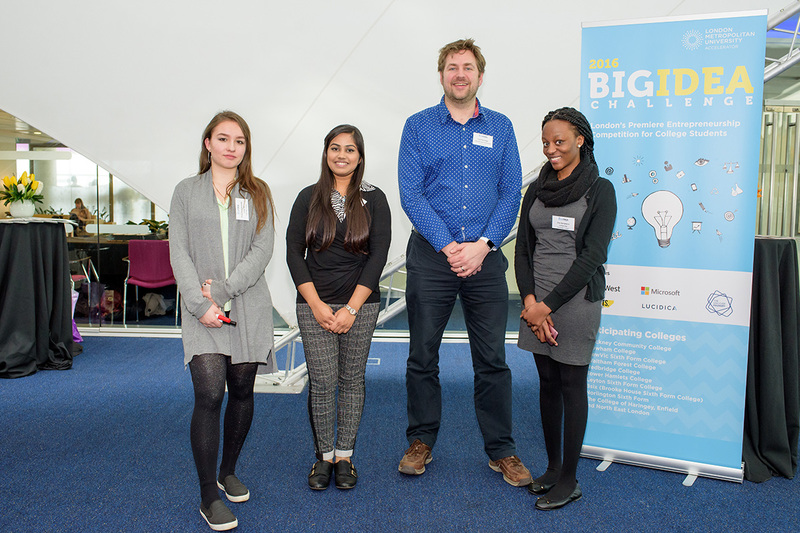 I was invited to mentor at this year’s Big Idea Challenge, a competition for young business minds, held at the Natwest RBS Building in the City of London. Students, graduates and staff from London colleges were selected via heats to pitch their business idea to win a share of a prize pot worth £30,000. Be it “a killer new business, a mind-blowing creative experience or a worthwhile social project”. I mentored an energetic all-female group from Redbridge College, whose idea was the creation of a ‘College App’ that provides better communication between educational establishments and their students. Like what you see? Please vote for them if you think the idea sufficiently deserving! I thoroughly enjoyed my day; it was an invaluable chance to encourage tomorrow’s entrepreneurs to follow their dreams and share my own knowledge and experience gained from running UrbanThings. I was fortunate to secure a sit-down discussion with UK Trade Minister Lord Maude this week. This formed part of our ongoing involvement in the Go Global mission to China. Lord Maude and myself discussed how we might best realize UrbanThings’ ambitions to bring our mobile apps and platforms to a global audience here in China. It was invaluable to get an insight into how we might tackle these exciting growth markets and what support we can expect. On a more general note, I’ve been very impressed by the FCO’s support throughout our time here in China – their representatives been a constant source of advice and useful information. Did you know, for example, that Bristol City has been twinned with the city of Guangzhou to explore opportunities in connected city innovation? Cities throughout the world face the same challenges and the opportunities in this global marketplace are varied and exciting. UrbanThings has been accepted onto the Go Global Trade Mission to Shanghai, an initiative by Enterprise Nation to take forty innovative UK businesses to China. While in Shanghai, we’ll be exposed to some of the country’s top tech talent, with presentations from PayPal Asia, JD.Com and trips to the Chinaccelerator, Zbird.com and numerous other local expertise in the largest global marketplace. The event is supported by PayPal, HP, HSBC and UKTI. Trade and investment minister Francis Maude will also be joining us on the trip. On a personal note, I am excited to be joining such a talented group and looking forward to finding out how we can expand our apps and platforms further into this market. Let’s go global!